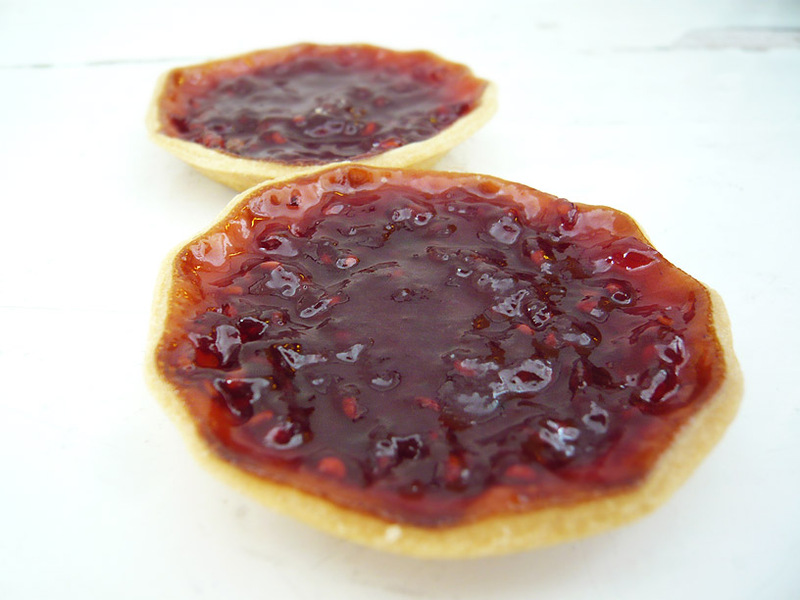 The second post from the Naming Day party – simple, traditional and ever-popular jam tarts! We had glorious weather in London yesterday and spent all afternoon sitting in the back garden talking and playing games. It was a really great day, and I am glad that I took a selection of goodies that could be passed round, as it really suited the informality of the day. Sitting on the lawn in the sun meant that jam tarts seemed somehow very fitting. All very Alice in Wonderland next to the tulips and under the lilac tree. These are really simple to make – you just need thin pastry and some good jam. I used blackberry jam that I made last year from fruit in Stoke Newington’s Abney Park and some raspberry jam made from fruit picked at the end of the summer at a house in Junglinster in Luxembourg (and yes, it was transported in a punnet across Belgium and on the Eurostar back to London). Both jams were made with a lot of fruit and as little sugar as I could get away with. The result was very fruity, flavoursome jam which were both great in these tarts. Butter a tart pan. Roll the pastry very thin (I got mine to 1mm), and cut out circles with a cutter to line the tart pan. Put in the freezer until the pastry is solid. To cook, preheat the oven to 150°C. Fill the pastry shells with baking beads, and cook for 10 minutes (you will end up with the slightly fluted edges – this was a happy accident in my case). Remove from the oven, allow to cool slightly, then remove the baking beads. Add jam to each tart – these were about 5cm across, and took one generous spoonful each. Don’t over-fill, as the jam will bubble in the oven and weld the tarts to the pan. Bake for around 15-20 minutes until the pastry is golden. Once done, remove and allow to cool completely. If the jam has leaked out and glued the tarts to the pan, heat the relevant tart very gently over a gas flame – the jam will soften and the tart comes right out. Worth making? These are simple and delicious, so really worth trying. If you’ve made something else and have pastry left over (sweet or savoury), then this is a neat way to use them up.